We’re back in action again tonight, with our NFL Division One Round 3 match against Cavan throwing in at MacHale at 7pm. Anthony Nolan of Wicklow is the ref for this one. We’ve made the perfect start so far to this League campaign. Two wins from two starts mean we go into tonight’s game on top of the Division One table, with fears of relegation already receding and idle thoughts starting to stir about more lofty achievements this spring. Cavan, by contrast, come to Castlebar this evening seeking their first League points of the year. Two defeats – both narrow ones – leave them with significant worries about the drop and they know all too well that those concerns will be amplified if they lose this evening as well. That makes the Breffni men dangerous opponents tonight. They’re sure to deploy the kind of deep-lying defensive formation we find hard to break down – especially in the tight confines of MacHale Park – and so we could easily get sucked into a dour struggle for supremacy. It’s important we retain the focus that has helped us get the two wins we have under our belts this year. Despite the tough going two weeks ago against Roscommon we never panicked and gradually took control the longer the match went on. Last Sunday up in Omagh we were patient for the first twenty minutes and then, when Tyrone, slackened off a bit, we moved in quickly for the kill. If we operate tonight with the same kind of high tempo – a style James Horan always seeks in the teams he sends out to play – this should mean that we’ll ask serious questions of Cavan. The quicker we get at them and start to open them up, the better. A good start for us will force them out of their defensive shell, at which point further chances should appear for us. We’re favourites to win tonight and win we should. But League football remains a great leveller: last Sunday proved this with our unexpected win over strong favourites Tyrone. We shouldn’t forget either that the last time a winless Cavan came to town – two years ago – they left MacHale Park with the spoils, despite the fact that we enjoyed a positive start that day. So, the less we think about where we are in the table and what possibilities a win tonight might create for us, the greater it’ll help to keep our focus firmly on the task in hand. Which is a simple one – stay tuned in and drive on to another win. If we manage that, what may or may not come after for us will look after itself. I’m hitting the road west in a bit and looking forward to being in MacHale Park this evening. If you’re on the road yourself today, take it handy and make sure you make it to Castlebar in one piece and in plenty of time to get a good seat for what promises to be another tough League fixture. Here’s to continuing this positive start to the year, here’s to driving on and getting another win under our belts. Winning is a habit so let’s keep this winning feeling going. Up Mayo. Best of luck to the team and management tonight. 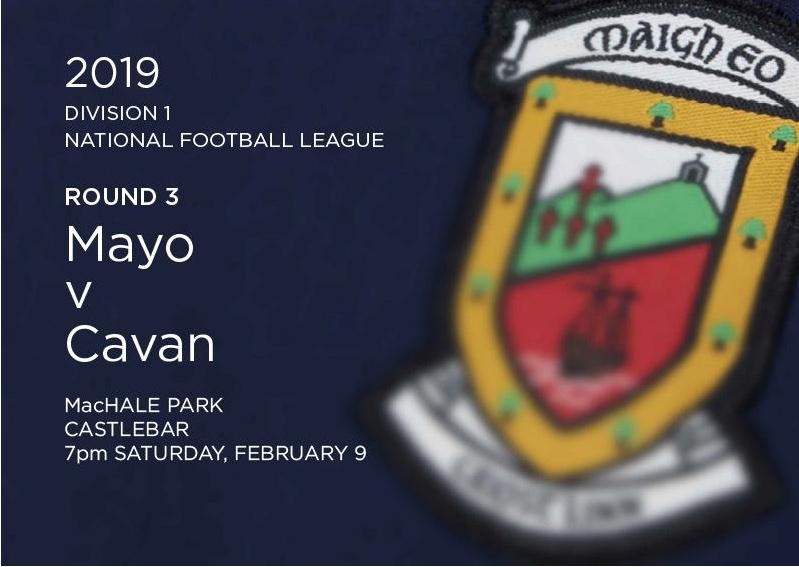 I cant make it but why is both RTE & Eirsports 1 both showing the Dublin v Kerry game live and then eirsports 1 showing deferred coverage of Mayo v Cavan game after. During the week eirsports 2 was schedule to show Mayo game live but then I saw last night it had changed. Can we all get behind team from minute they run out on the field, when team being announced and all way through game. It is vital we push back against any negativity against our players. Proud of them all. Mayo Abu. Best wishes to Mathew Fionn Michael Colm Evan Ger and all the Mayo team and mentors. Get behind the team Mayo by 2 with a bit of luck. Best of luck to all the new players this evening. Looking forward to seeing Ruane at midfield. Very positive about this one. Mayo by 5 or 6. Looking forward to the game tonight now and a good crowd in McHale Park. Would love to see Ruane lad put his roots down for this team, I believe he has a lot of what we are looking for. A neat performance, a tidy win and a clean bill of health…….sure what more could we ask for. What a win tonight and offers is the chance to go into croke Park in two weeks with only a very, very slim chance of us skipping to division 2. That’s a good prize at this time of year. Hopefully we do the business. No value in backing Mayo at all tonight. We were 9/4 last week and 1/4 tonight! I hope the bookies are right this time! The crowd need to play their part this evening aswell. Itll lightly be a tough low scoring game with Mayo needing to be patient and retain possession until we engineer a shot. Hopefully no groaning from the stand. Lets have it like v Derry in 16 and v Fermanagh in 17 and less like v Galway in May. Support means support! The Mayo subs for tonight according to the program. Cavan to edge it by 2. Best of luck to our lads. It’s live on Eir sport 2 now. Now where the facebook merchants!!? Well played Ger Caff, well played. Totally agree Tubberman! Well done Ger Caff. Delighted for him. Aido brilliant. Great to get the win. What a night it will be in 2 weeks time in Croke Park. Solid performance, Caff deserves all the praise he gets, specially after all the shite talk he gets, he was brilliant. Corick Bridge, no we can’t easily win the league, 4 games left with a final after that. Caitlin, Eir analysts gave it to Caff. Congrats to Ger Cafferkey on his man of the match award. Job well done by the team although we could have won by more. That said no late goal or flurry of points that reeled us back in which has happened a bit more than one might like of late. Lots of positives to take from our league campaign so far. Good win. Nice not to be hanging on in injury time which happened a lot the last few years. Super game from Caff, stuck it to the naysayers. Dublin losing isn’t good for us unfortunately. They’ll be flying it in 2 weeks to make up the lost points. Umpires need to go to Specsavers. Mcloughlins free at end was definitely over and coens shot too snuck inside. I was behind goal on stand side so perfect position. Overall a patch performance. Solid defensively but we kicked a tonne of possession away. Sloppy. Mayo win dubs beaten……..enjoy the night folks!! If Carlsberg made dreams – Dublin in relegation battle. 2 losses from 3 for the Dubs is this the start of their fall from grace ? 🙂 On a serious note does anyone know the last time they had such a bad start ? On ourselves to night it’s hard not to be impressed .Ger Caff well deserved motm .I think he won nearly all the ball that was driven in his way .Coen to was strong .Ruane got on a lot of ball in first half .Im enjoying our attacking it’s a lot more direct lads taken on shots to night that maybe last year would have recycled back again and again .3 from 3 young lads getting game time what more can we ask for? Out of curiosity …what ever happened to James Carr?? Also any update on Parsons? Three wins on the trot and Ger Caff winning MOTM..I mean would we really have predicted these occurences a month ago??! Considering the barrage of abuse he has received over the years Im.delighted for him..Really hope his form becomes consistent..Backdoorsam..agreed. Kerry looked very hungry and determined tonight. But Dublin are always likely to whittle it back… great game. Delighted with Mayo win… sadly I don’t have eir but just happy we’re doing so well. Fair play to the lads and JH…he does something for the confidence! Yes Dublin will be chomping to win but it’s an opportunity for a new look Mayo team to lay down their own marker and let them know we’re not gone away. Great to see our young bucks impressing and the more seasoned lads showing how to do it. Keep the heart Mayo. Mighty Mayo ? Anyone know where Conor Diskin and Colm Boyle were 2nite? We are goin to need there aggression against the Dubs in Croker in 2 weeks time. Thought Ger Caff did really well some regulars on here are going to very quite 2nite, Clarkies kickouts were very poor 2nite to many of them went too high and were 50/50 balls and his short ones got us into trouble too, I feel Horan will have no option but to call on Hennelly for the Dubs as kickouts will be vital if we are to beat them. Next 2 weeks are huge for Horan and Mayo to lay down a marker in Croker. Goodman Ger. Left me scratching me head plenty of times and here he is with a MOTM performance from mostly outta nowhere. Maybe his best is yet to come? I hope so.